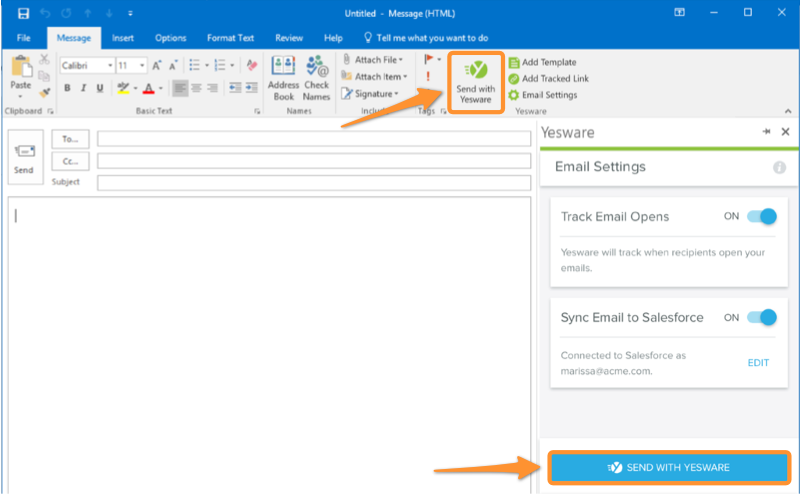 Yesware partnered with Microsoft to launch an add-in for Outlook to the Office Store: Email Tracking From Yesware. Microsoft recognized a need in its customer base and asked Yesware to join them as a SaaS provider by building an Office 365 add-in. Here’s why: Expanding our Outlook integration helps more people work smarter from their inboxes. Email Tracking: Use Send With Yesware to track your messages and links with real-time notifications. Templates: Create a library of customizable templates you can use, personalized to each recipient. Campaigns: Make automated, personalized email campaigns that send on their own based on recipient engagement. Salesforce Sync and Sidebar: Say goodbye to data entry. Automatically log messaging and email engagement to Salesforce. If you’re a Yesware user on Outlook for desktop, keep doing what you’re doing. Just know that you can now access email tracking via Outlook for web if you wish to do so. For Mac users who are new to Yesware, this is great news; we’re now compatible! 🎉 You have the ability to access our email tracking by logging into the web version of Office 365 and downloading our add-in from the Office Store. Note: the add-in requires the latest version of Chrome, Safari, and IE11. Beyond our 28-day free trial, you’ll need a Yesware subscription to continue using our features. Click here to check out our listing in the Microsoft Office Store.